Respiratory System Description | Your Guide to Healthy Living! The human Respiratory System is of key importance since it supplies oxygen to our body cells to live and function properly. Our body cells require oxygen to burn fatty acids and sugars (carbohydrates/glucose) in the production of energy. Another important function of the Respiratory System is get rid of excess levels carbon dioxide in your blood, which could harm your body’s organs. The best supplements that work for the human Respiratory System supplements the nutrients needed for the health of the lungs and other respiratory organs. 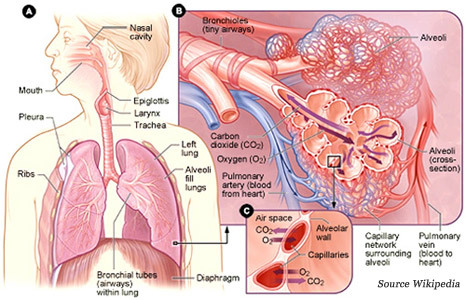 The Respiratory System description assists you in the understanding of how the system works. This helps to you to make better Lung Health and Respiratory Health supplement choices based on what your body needs. The role, main functions and main organs of this human body system are discussed below. The Human Body Respiratory System (also called the Gas Exchange System) is the group of tissues and organs that allow you to breathe air to supply oxygen to your cells throughout the body. It enables the body to get rid of carbon dioxide by breathing air out. Respiration is simply the exchange of oxygen for carbon dioxide. The Respiratory System also performs other important functions as discussed below. Gas Exchange Respiratory Function: External gas exchange is the movement (external respiration) of inhaled oxygen (O2) within the alveoli to the bloodstream. System then expels (exhaling) other gases such as carbon dioxide, a byproduct of cellular metabolism from the lungs. Carbon dioxide (CO2) is transferred (internal respiration) from the bloodstream to the alveoli and excess carbon dioxide is exhaled. The Alveoli is tiny sacs within our lungs. Homeostatic Regulation Respiratory Function: The homeostatic regulation function regulates the pH in the blood by regulating carbon dioxide. Protective Respiratory Function: The Respiratory Human Body System protect us from inhaled pathogens and irritating substances. Vocalization Respiratory Function: The Respiration System facilitates speech by vibrating the vocal cords in the larynx (voice box) to produce sound. Olfaction/Smelling Respiratory Function: Olfaction is the sense of smell that occurs as air passes over olfactory fibers in the nasal cavities. Olfactory fibers transmit nerve impulses about odors to the nervous system, which is perceived as smell. The organs of the Respiratory System are the nasal cavity, pharynx, larynx, trachea, bronchi and lungs. The most highly recommended supplements that work are based on 1,000s of user reviews. These supplements will be continually updated. Please provide comments and submit supplement recommendations that worked for you, on Lung Health and Respiratory Health, by completing the form below.